A popular appetizer to serve anytime of the year. 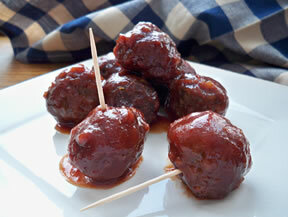 These meatballs are perfect for holiday gatherings or they are sure to be a hit at your next Super Bowl party. Mix ground beef, breadcrumbs, onions, milk, egg, parsley, salt, pepper, and Worcestershire sauce. Shape into 1 inch balls. Place on a broiler pan and bake in an oven at 350 degrees F. for 20 minutes; turn and cook for approximately 10 more minutes. Cook until they are no longer pink in the middle. Drain on paper towels. Heat chili sauce, jelly, and brown sugar in a saucepan, stirring frequently until jelly is melted. 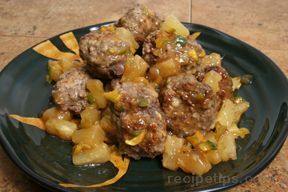 Add meatballs and stir until thoroughly coated. Simmer 30 minutes, uncovered. 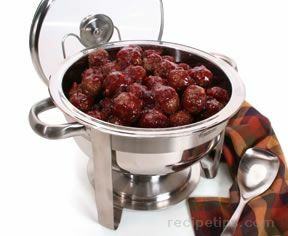 Meatballs and sauce can also be placed in a crockpot and cooked on low for 1 to 2 hours or until thoroughly heated. 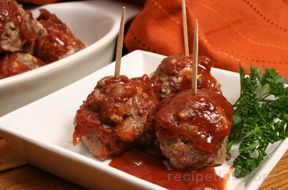 "We tried a half a batch of these meatballs this weekend to see if we liked them before making them for a Super Bowl party. They were even better than we thought they would be and we loved cooking the meatballs in the oven. That was so much easier than frying them in a pan. We might have to double the batch for the Super Bowl party."